Thank you. Tweeting now. Your blog is a joy to read, even for a very rusty Latinist such as me. God bless, from the other side of the Tiber. I have it on good authority that at Saint Josemaria's suggestion, Opus Dei priests used to say the old offertory prayers quietly and in addition to the new ones, during the lavabo. Evidently this is not done by newer priests of the Work. I think, or maybe imagine, that I can tell if the priest is in fact praying the old offertories silently based on the length of time he takes to dry his fingers after the washing, and also from the especially recollected facial expression. It is very edifying. 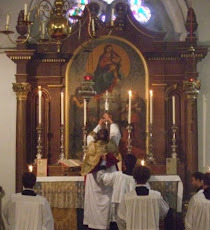 It has intrigued me how priests not known for their Latinity nor their traditional liturgical interests will often, quite unconsciously, point at the consecrated elements (briefly lowering their outstretched arms to do so) when referring to "this Bread and this Cup" or however the similar words run after the Consecration, whichsoever of the Eucharistic Prayers they happen to be using. It is entirely obvious that in this practice we have the seeds of a ritual pointing to the elements organically developing, and soon enough this may change into "the done thing", and done, eventually, by making the sign of the Cross over each. In other words, "the nature of man requires" the postconsecratory signs of the Cross in the Canon, and soon enough custom will restore them. Father, only last Sunday I wondered about the Offertory.